If you have any of those plastic fillable eggs lying around have the kids make their own Egg Buddies! This is a great way to show children all about planting seeds, caring for them, and watching them grow! Great for preschoolers on up! 1. Cut out some feet from construction paper or foam board and glue them onto your egg carton section. Glue your google eyes onto your egg. Usually those plastic fillable eggs have a larger half and a smaller half, use the larger half. 2. Fill your egg with potting soil, about ⅔ full. 3. 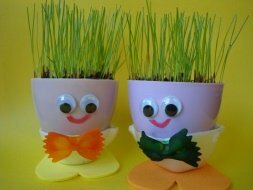 Sprinkle grass seed on the top of the soil, try not to leave any big bare spots. Cover the seeds up with about ¼" of soil. Water your egg buddy well, let the excess drip out of the air holes in the bottom. Place in your egg carton section. 4. Now that all of the wet part is done, you can glue on a smily face. We also added a colored bow tie. To do this easily just put a few drops of food coloring into a baggie, add your bow tie macaroni and squish it around until it's coated and lay out for a few minutes to dry. Glue it to your egg carton section. 5. Place your egg buddy in a sunny window and watch them grow. Depending on your grass seed you should start seeing growth in 5-10 days. *Most plastic fillable eggs have "air holes" on the bottom, this provides perfect drainage for your egg buddy. All plants need drainage to grow. If your eggs do not have air holes then you can place some small pebbles in the bottom ¼ of your egg for drainage. If you don't have grass seed lying around you can by a small bag of "bare spot repair" grass seed at a home improvement store for a couple of dollars.